This shop about Chocolate Granola Bites has been compensated by Collective Bias, Inc. and Quaker. I am sure there is a cookie or side dish that reminds you of a family holiday meal. Whether its the type of stuffing your grandma made at Thanksgiving or a special cookie that was always on your cookie platter at Christmas time, food is all about memories. My dad had a secretary many years ago, named Debi, and while she worked for my dad, every year we would get a tin of her Chocolate Granola Bites. (At least this is what I named them for this post we always knew them as Debi’s Candies). When she stopped working, my mom still made them for as long as I could remember. I have not been home for a Christmas in several years, and when shopping around Walmart for groceries this week, I happened upon a box of Quaker® Simply Granola and it immediately brought that flavor of these Chocolate Granola Bites back into my head. 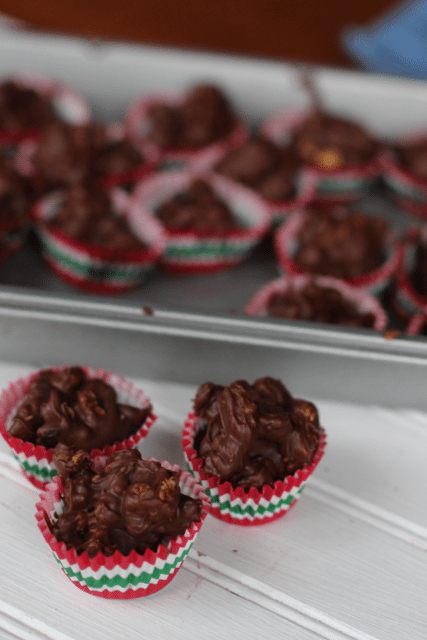 I was able to find all the ingredients at Walmart, they are super easy and a no bake cookie option during these hectic holiday times. Who says Granola only good for breakfast over a bowl of yogurt anyway? Why not mix them up with some extra raisins, chopped pecans, melted butterscotch and chocolate chips for a powerful punch in your mouth. 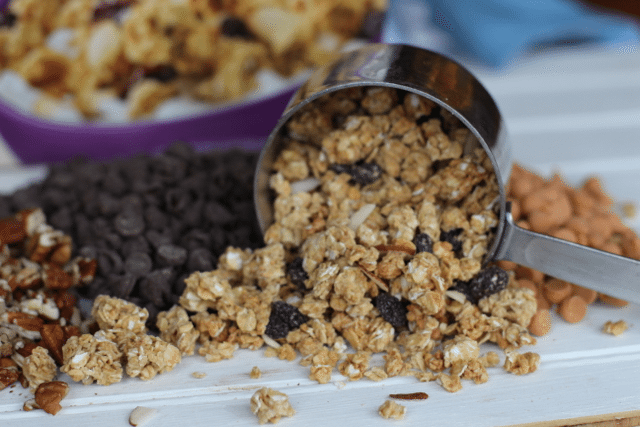 The Quaker® Simply Granola already has raisins and almonds so these ingredients really make them stand out with the perfect crunch. 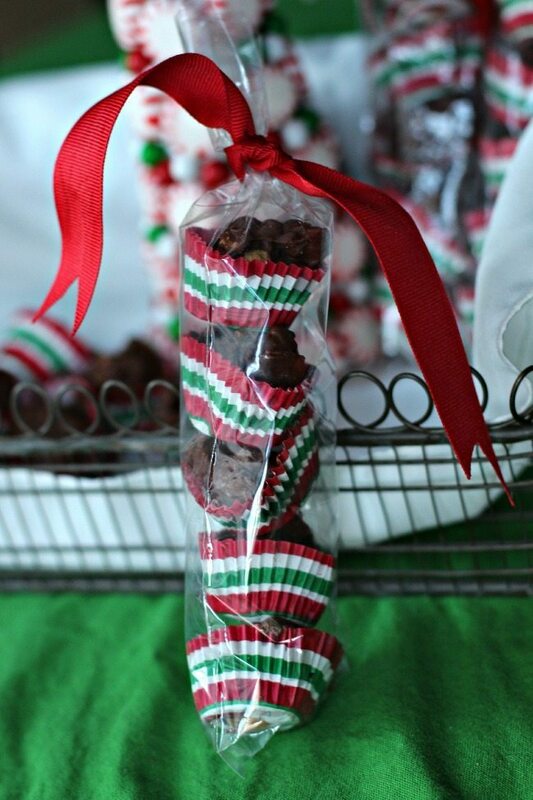 You can make these on a parchment lined cookie sheet or I like to scoop them right into a cute Christmas mini cupcake papers. Just lay them out before staring the process. Melt the chips together in the microwave until smooth. Add the rest of the ingredients until everything is properly coated. Using a small ice cream scoop, fill each cup. Allow to harden in the fridge for about 30 minutes. For gift giving, I used pretzel cellophane bags and stacked them. TIP: to avoid the hassle of them tipping over. I found putting the bag into a tall glass and using chop sticks to keep it open was most successful. 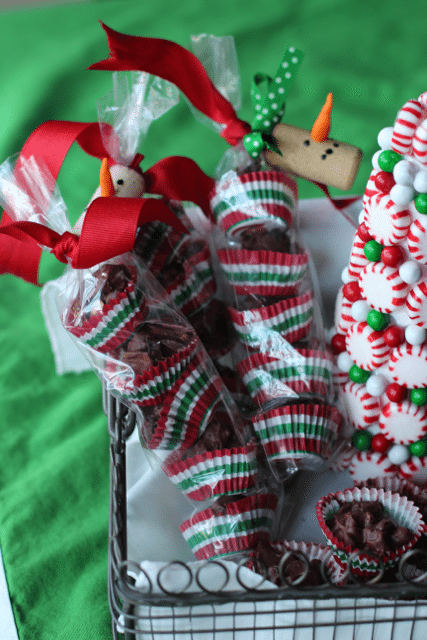 Tie it with a bow and you can add a fun Cork Snowman tag. 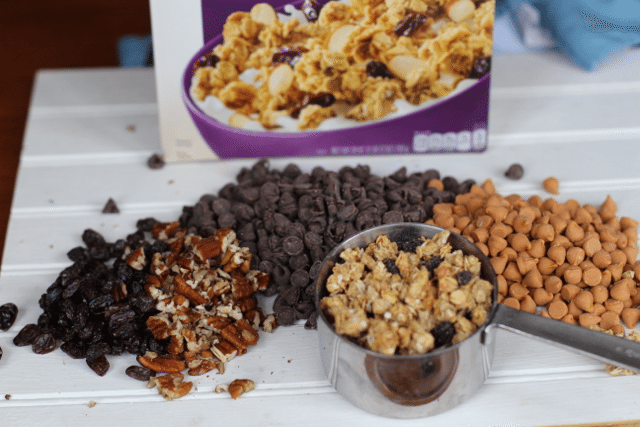 Perfect combination of Chocolate and crunch Granola nuts and raisins. 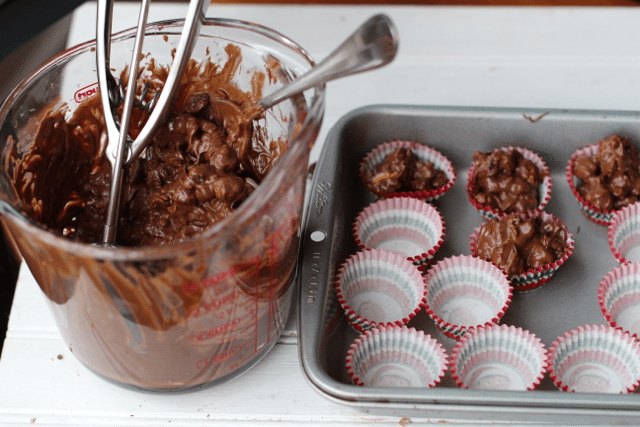 Melt Chocolate Chips and butterscotch chips in a bowl in the microwave for 2-3 minutes. 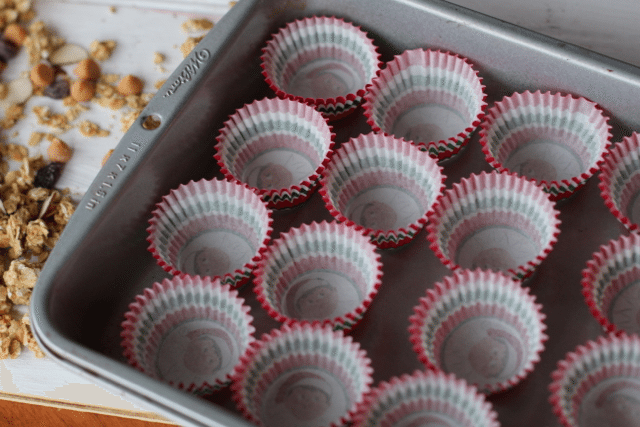 Use measuring teaspoon or small ice cream scoop and soon into mini muffin cups or onto a parchment lined cookie sheet. Refrigerate until firm about 30 minutes. What is the one food that reminds you of your childhood holidays? « What’s Your Wish This Holiday Season? I LOVE this cereal. I just tried it recently when it went on sale. 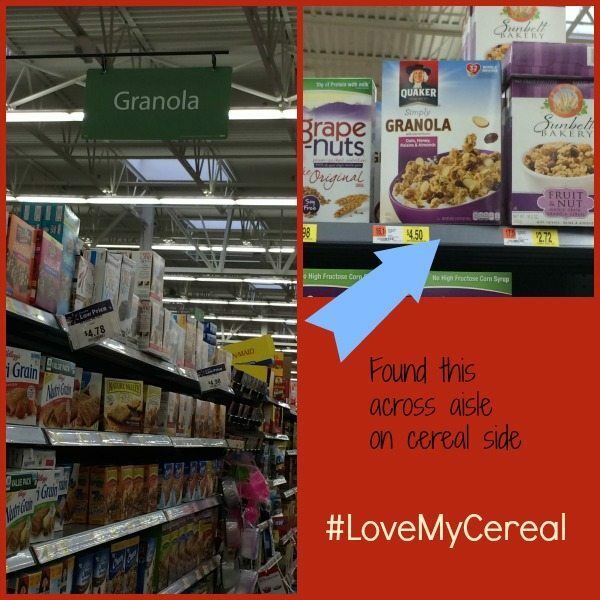 I love granola and oats in general, but this was even better than others I’ve tried. And to make it into this yumminess is awesome. I love how easy it seems to be to make. Something the kids could even help with. Looking forward to trying it out! These look so yummy and super easy to prepare! I love how you have them wrapped in festive colors. A good display just seems to make food taste better. 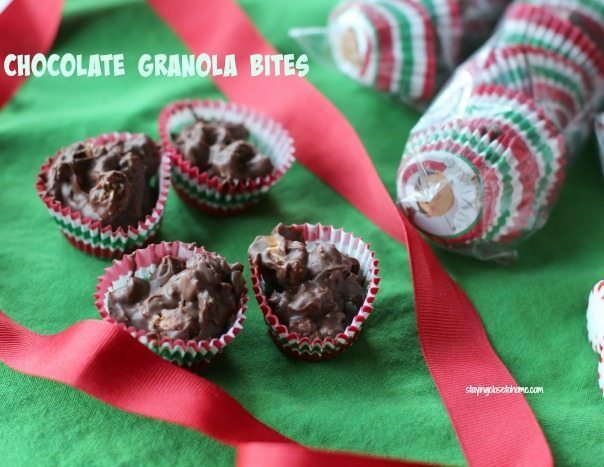 I think I want to try to make these for snacks on Christmas. I am the boring one who only recently started eating granola for breakfast this year, I have been enjoying it because before i used to think it was for health nuts and now i am one of them lol. Anyway this recipe is simple and looks easy enough to make and i wouldn’t mind trying it out since it does not really require any baking from me. I can do this. I can make these tasty treats. I am a horrible baker but I could make these. I love Quaker Oats granola and I love the candy paper too. Where do you get that? Michael’s? Thanks for the great recipe. This is an amazing recipe! 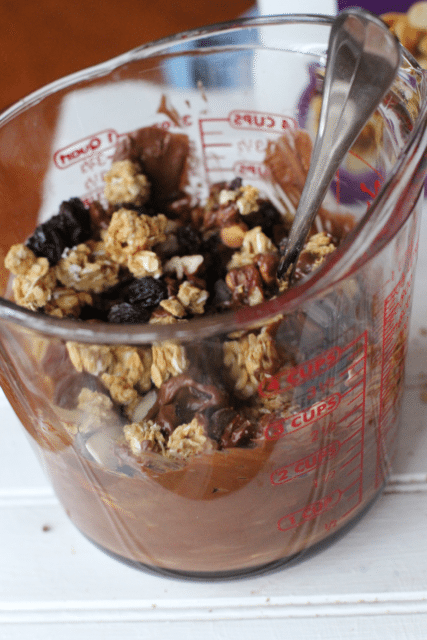 I never would have though to create something with granola and chocolate. I typically dislike granola but this looks great! I love anything chocolate covered! Thanks for sharing this greatness! Well that looks really delicious and delectable. And it’s so easy to make!! And I love the way you packaged them up for gifts. I love Quaker Granola, but haven’t had any in a long time. So this is a great reminder for me to go pick some up on my next shopping trip. Thanks! Our holiday meal when I was a child would always compose of roasted pork and cupcakes for desserts. I love the idea of granola bites, though. It’s healthy, but still tasty. I’m sure the kids would love it, too! 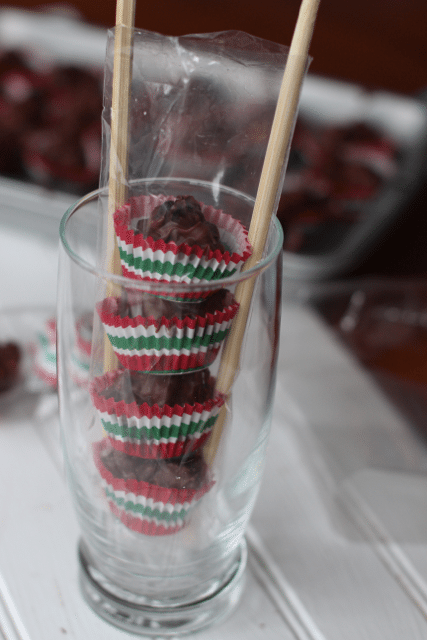 Our holiday meal always involves sweets or desserts made of chocolates. 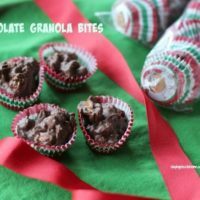 For a long time now, we haven’t made chocolate granola since there’s a lot of other new treats introduced in the market and given to us as presents. That granola looked easy to make and presented in a very neat and tasty way.